My car was forced to a standstill as a heavy vehicle bulldozed its way into the street through a cloud of dust, belching noxious fumes in its wake. A flimsy steel fence separated a gaping deep hole in the rock face from several stranded drivers hooting their horns in frustration. A screaming baby in the next car just added to the drama. Nobody provided any direction out of the chaos. This is not the aftermath of a bombing in Syria but the almost daily grind of driving through Sliema's Mrabat area where some six construction projects are underway in a stretch of about 150 metres. In reality, the locality is just a detail – it could be St Julian's, Buġibba, Marsascala. 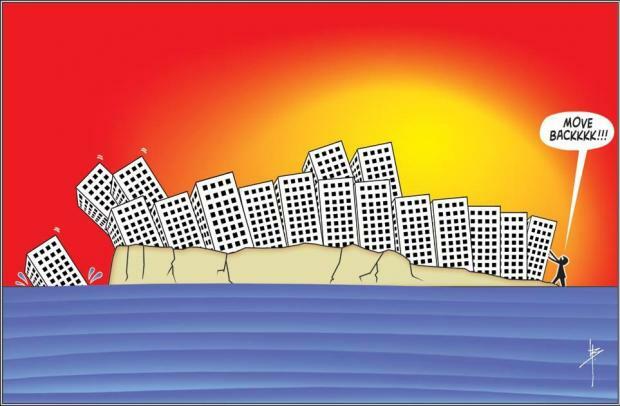 Malta is one big building site with no respite on the horizon. But while our obsession with demolishing beautiful old buildings to make way for tasteless blocks dates back a few decades, it is becoming obvious that law-breakers are increasingly operating with impunity as enforcement officers appear to have taken a sabbatical. Which is why almost every day you see tower cranes elevating heavy material irrespective of the danger posed to vehicles and pedestrians below. Which is why contractors feel they can jackhammer their way deep into your sleep. Which is why we witness dozens of drivers every day breaking every imaginable law written in the highway code. Which is why restaurant owners feel they can encroach pavements or parking space. Which is why Malta is becoming filthier by the day. If you want to see it displayed in one go just head to The Strand in Gżira. I recently got into an animated argument with someone I happen to know (a businessman who loves cutting corners) who said the government is doing the right thing to turn a blind eye to "minor infringements" so as not to "halt progress". Of course, his constant brushes with the law were earning him a slap on the wrist... at best. “Kulħadd irid jiekol (everyone has a right to earn a living),” was his parting shot. Which is fair enough, were it not for the fact that the rest of us mere mortals also have a right to a decent quality of life. Constant noise (especially now with the festa season), unregulated environmental disasters and reckless driving should not become part and parcel of our lives. An economic boom does not need to come at such a huge cost. Ultimately, it boils down to basic respect. Whether it is perception or reality, it's something the government needs to tackle sooner rather than later unless we are about to fast-track our descent into organised chaos. No wonder most of us are living in a state of perpetual rage and frustration. The situation is not going to get any better. Local councils are desperately starved of the cash they need to enforce the law and clean up their locality while the big contractors and the businessmen with links know they are operating in a country where might is right. 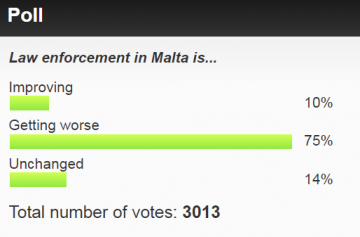 Our online poll shows many believe law enforcement is getting worse. This kind of institutionalised vandalism has to stop. The “u iva mhux xorta” mentality cannot prevail for much longer because before we know it the s*** will hit the fan. I'm not suggesting turning Malta into a police state – we don't have enough officers anyway - but the sight of someone in uniform will always serve as a deterrent. After all, it is the maintaining of law and order which differentiates a civilised country from one where the law of the jungle rules. Since law enforcement appears non-existent in too many areas in Malta, throughout the summer Times of Malta we will be highlighting the law of the jungle in our environs. We promise to try to plug the gap between the blatant law breaches on our roads and the surrounding environment and the lack of enforcement. But we need your help to also highlight hidden irregularities. So send us any pictures or clips of any law breaches via email to mynews@timesofmalta.com. We promise to try to do our bit.